One of the most popular and classical themes in the visual arts is the portrait. Drawing a portrait is however not one of the simplest exercises. As our eyes are trained well on the recognition of faces, we detect errors and inconsistencies in portrait drawings very quickly. But even though we recognize that something in the picture is not correct, many find it difficult to tell where the fault lies. In this guide about portrait drawind, I would like to give some tips and hints about what you should look at when you are drawing or painting a portrait or a face. If you want to learn to draw people, you will find here hopefully some useful tips. Before you try to draw the face of a certain person, you should begin with some basics. Especially important when you draw a face are the proportions. Of course, every person looks different but many basic proportions are almost always the same and there are typical drawing mistakes that were mainly done by beginners. You have to look at the height of the forehead and the position of the eyes for example when you are drawing portraits. The forehead is often intuitively drawn too low and that makes the eyes on the face slip up too far. The eyes are round about in the middle of the face. Perhaps it is because of the hair, that we are fooled in our own perception. When I started to draw portraits and people, this fault happened me as well. As a kind of unit when you are drawing faces or portraits you can use the nose. The eyes divide the face in the vertical into two halves. The forehead is about two noses high, the nose (guess) is one nose high and mouth + chin is also one nose high. The height of our face counts four noses. 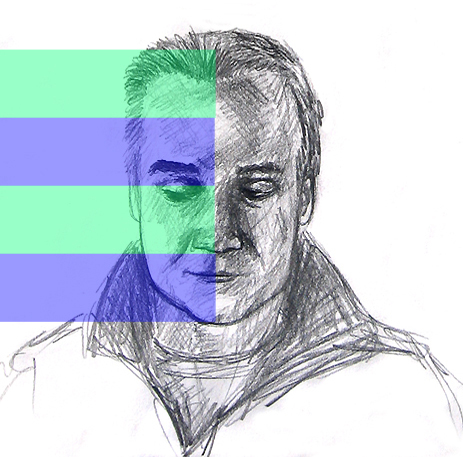 In the picture below you see again the rough partition of the face in the height (colored markers). There are also important clues for the width of the face that may be considered when you draw or paint a portrait. There is often overlooked when drawing a portrait or a face that the area next to the eyes roughly equals the width of one eye. The distance between the eyes equals also the length of one eye. Summing the face is about five eye lengths wide. 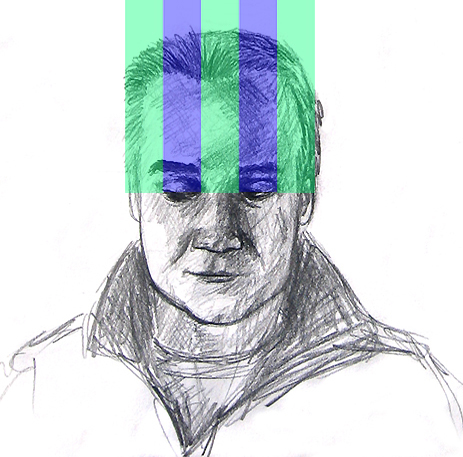 In the picture below you can see again the rough partition of the face in the width (colored markers). In the following you see step-by-step the drawing of a portrait. With rough sketches of this kind you can practise drawing portraits quite good. And here anotherhint: A typical mistake while drawing portraits is for example that the back of the head is drawn too shallowly . Also note: The back of the head is globular, not flat. You can see it in the series of pictures below. At best take your pencil and the sketching block and try to draw a Portait by yourself. I hope you will have a lot of fun and a lot of success by drawing or painting!